Got a new article up on the site, complete with a video. This one is on how to do the backflip. I don’t claim to have the best backflip in the world. I know it needs some work for improvement. But I can do them standing on flat ground outside. And I know more people want to pull of this acrobatic skill than are currently able. Just reading the article won’t give you the ability to do it, but if you want to work up to it or currently are you’ll find something useful. On Thursday I’ll be sharing an important update to the Tumbling Course with you. P.S. Don’t forget today is the last day to get a bonus Acrobat Accelerator issue along with the Secrets of the Handstand Quickstart Guide. Here’s a few of the new pages I was talking about. These will be especially helpful for new people entering the site but if you’re looking for something in a certain category you’ll be able to find it here. These pages act as a portal to other parts of the site that can be helpful. Right now there are three, but that’s likely to increase in the future. The Handstand Basics page for people just starting out on the hand balancing path. The Advanced Handbalancing page really is for anything above and beyond a handstand. 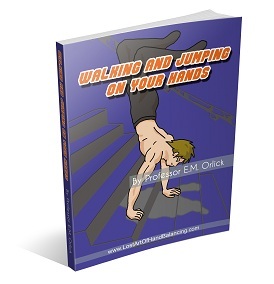 All intermediate and advanced hand balancing products, articles, blog posts, etc. can be found here. Then there’s the Acrobatics page. This covers all manner of acrobatic, tumbling and gymnastic moves outside of hand balancing itself. The last two especially will be expanded in the coming months. More articles, video and the like. If you have suggestions for specific articles or videos you’d like to see you can use the questions form. Right now you can find links to these portals on the bottom of every page on the first line of the footer. P.S. Remember the Prof. Orlick books are now available in electronic form. Get them for $5 off. I wanted to share with you an interesting debate I had with one of my subscriber’s and than I want to encourage you to add your own comments. “I take issue with some of the things you say on this site, also I do not believe you should be creating videos and tutorials that teach people handstands when you yourself use the technique deemed improper by Gymnasts and Circus Artists alike. Deemed improper? Perhaps the straight body style is better but its not easier to learn. Having an arch is natural which is why it ‘use’ to be the only way up until about the 70’s. All the gymnasts (don’t actually know any circus artists myself) I’ve talked to say its just a matter of style anyway. In the end you should be able to take any position and balance right. After all look at many contortionists. Are they doing straight handstands? I agree with you partially here. Yes personalized instruction would be best but its not really feasible. But isn’t some instruction better than nothing? Not all the people that come to my site are looking at this as a career, just something they’d like to be able to do. “Just to add to the perfect handstand discussion that’s going on. I believe the straight bodied handstand came around when people were trying to emulate the standing up normally position on their hands to create a more stable position. Hands below shoulders below hips below feet, in essence standing up but reversed. “The arched position handstand is the beginners preference as the body naturally falls into that position and requires less core strength. The scorpion handstand common among contortionists is an entirely different type as this is a handstand trick rather than a base handstand. As you said earlier both work and are fine, but the more solid and versatile handstand in my opinion is the straight body one. And now here is your chance to weigh in on the situation. You know blogs are made to be two-way communication tools. But I haven’t ever encouraged this in the past. Well now I am. Think you can do that? I’d be happy if you took the time to give it a shot, so you can let me know what you think. P.S. It really sounds harder than it is. I’ve resisted this blog stuff in the past but once I got into it, its actually a lot of fun. This is one of my favorite pictures of all time with Doug Hepburn balancing a 205 lb. barbell plus a 145 lb. man doing a handstand on top.. Just recently I came across the same picture from another view. A perfect blend of strength and balancing. Not any strong person could hold this. Besides the 350 lbs. of weight it is really the responsibility of the under-stander to keep the person in the handstand balanced. If you haven’t heard of Doug Hepburn you may want to check him out. Suffice to say he was an all-around strongman, setting many weightlifting records in his time, and this was starting crippled at a young age. What most people don’t know is that he was also a fine hand balancer. Early in his career he was capable of twelve reps in the handstand press and five reps in the tiger-bend. Seeing and hearing about people like Doug Hepburn and Bert Assirati all doing hand balancing you can’t possibly think that hand balancing is only for the small framed. Large size is no excuse. P.S. Can’t say that being small doesn’t help though. Professor Paulinetti weighed around 110 lbs which made the One Arm Planche possible. To duplicate some of his feats check out The True Art and Science of Hand Balancing. This is just a sneak peak of what they best acrobats from China can do and one of many hand balancing tricks involving chairs shown in The Art of Chinese Acrobatics. That’s 16 people doing handstands on top of more than a dozen chairs and some other apparatus. My biggest question is how do you get into that? I’ve seen some crazy pyramid formations but this takes the cake. In this case it might actually be harder to get into position than hold it! Now you may not be able to pull of this stunt, but there’s no reason you can’t use a chair to increase your handstand skills. Try to press up into a handstand from a normal sitting position. Not a novice move but by no means a very difficult one either. It’s sure to amaze any onlookers though. P.S. You can see a picture of Bob Jones doing a hand balance on a chair on page 121 of The True Art and Science of Hand Balancing. Except in this case it’s a rocking chair adding even more difficulty to the balancing. As you can see the sky is the limit in what you can accomplish.